A Georgian food photo essay. Georgian cuisine highlights include lobio, khingkale, and khachapuri from homes, restaurants and markets in towns and cities across the Republic of Georgia. Read more about Georgian Food and our visit to Georgia. You never go hungry in Tbilisi since a khachapuri stand lurks around just about every corner, serving it fresh from the oven. This stand had the requisite cheese-filled variety, but also included some tasty mushroom and rice/tarragon filled varieties as well. Read more about Georgian Food and our visit to Georgia. A vibrant nosh assembled from two lovely and inexpensive stalls just off Kostava street in Tbilisi. 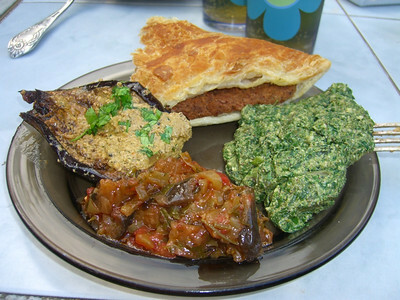 Lobiani (bean-stuffed version of khachapuri bread), badrijan (roasted eggplant with walnut paste), pkhali (spinach, walnuts, and garlic), and a tomato aubergine ratatouille. As Tbilisi summer heats up, retreat to a shady garden and serve with an ice cold Natakhtari beer. We did. Read more about Georgian Food and our visit to Georgia. 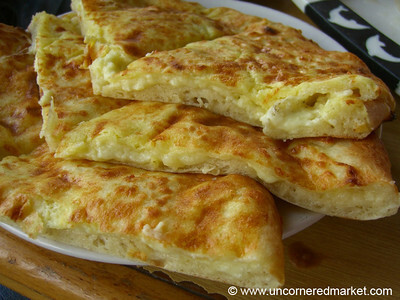 Khachapuri, the ubiquitous signature Georgian cheese-stuffed bread oozes gooey goodness. A common site on the Georgian table - breakfast, lunch and dinner. Very addictive. Read more about Georgian Food and our visit to Georgia. Tonis Puri (Georgian bread) folds up quite nicely. It's delicious too. Read more about Georgian Food and our visit to Georgia. 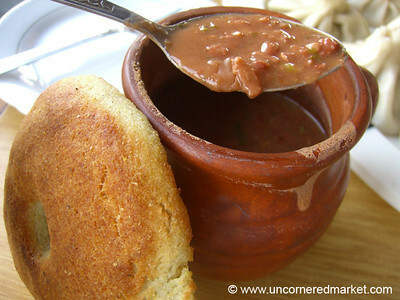 A popular restaurant outside of Mtskheta served up ceramic mugs full of our favorite Georgian bean dish - lobio. Here, it's complemented by mchadi (cornmeal bread that weighs as much as a brick). 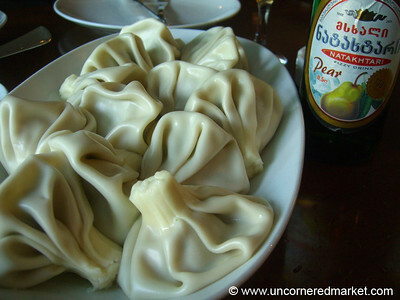 Like all Georgian feasts, this was only one of the numerous courses; we could barely move afterward. Read more about Georgian Food and our visit to Georgia. 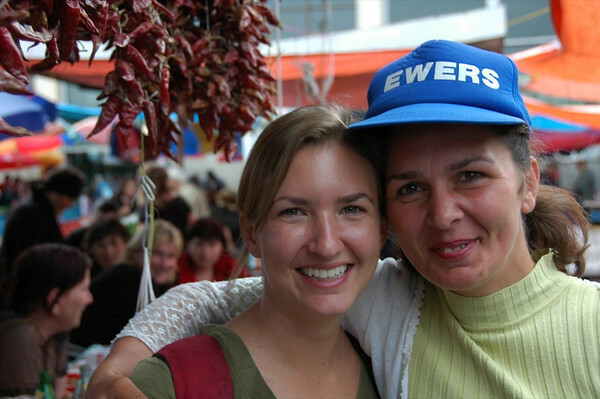 Lena introduced us to Khinkali (meat filled dumplings) on our second day in Tbilisi and taught us how to dust them with pepper and eat them with our hands (without spilling the juices). FYI, 25 khinkali dumplings were more than enough for the 3 of us! Read more about Georgian Food and our visit to Georgia. Actually, that's the name of the guy on the left (pronounced GO-cha). He really was gigantic...and friends with the skinny cheese vendor. When he saw us, the two unsuspecting Americans, he tried to physically pull us away to consume large amounts of wine. With the help of the other vendors, we managed to escape his overly hospitable clutches and save our already inflamed livers for a few more hours. Dan still has nightmares about Gotcha drinking him under a table in a parallel universe. Read more about Georgian Food and our visit to Georgia. These tomatoes looked almost too good to be true. Read more about Georgian Food and our visit to Georgia. 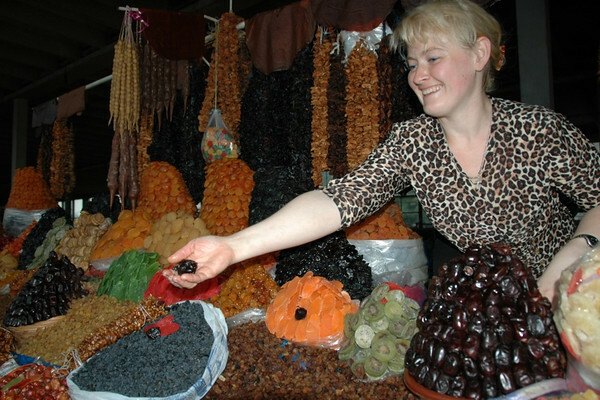 This friendly woman held court over beautiful piles of dried fruits at the Tbilisi main market. She allowed us to sample a handful of just about everything - apricots, raisins, and prunes to name a few. Audrey's not a fan of raisins, but even she liked the ones here. Read more about Georgian Food and our visit to Georgia. Some hot, some not...at the Tbilisi main market. Read more about Georgian Food and our visit to Georgia. 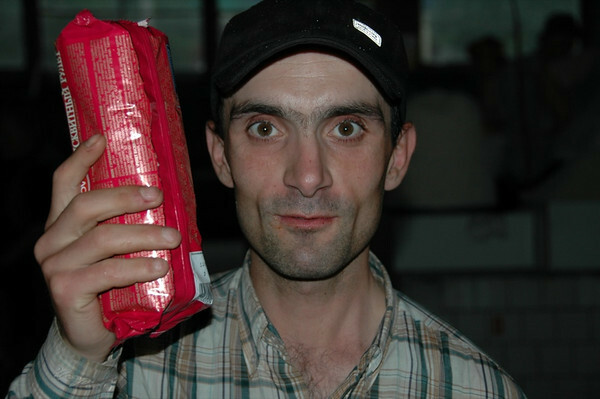 Not quite sure what this guy was selling, but he insisted that Dan take his photo. Then he waved and walked away. 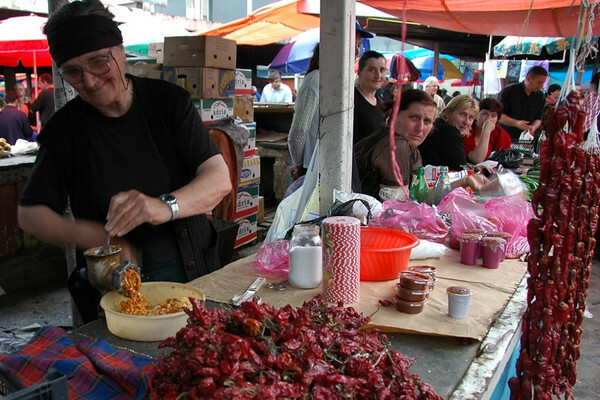 It takes all kinds to make Tbilisi (and its main market) tick! Read more about Georgian Food and our visit to Georgia. The only words of English this vendor knew was "I LOVE YOU!!" so each time we would walk, that's what she'd shout. We'll take it. Read more about Georgian Food and our visit to Georgia. 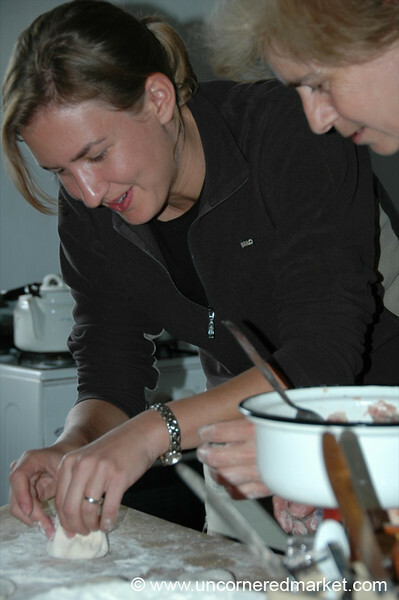 When Lali sensed our enthusiasm for Georgian food, she agreed to make khinkali (meat filled dumplings) from scratch with us. Once the meat filling is made, it's all about the fill, turn, tuck and twist. Depending on whom you talk to, khinkali tops require 21 or 37 turns. But who's counting?? 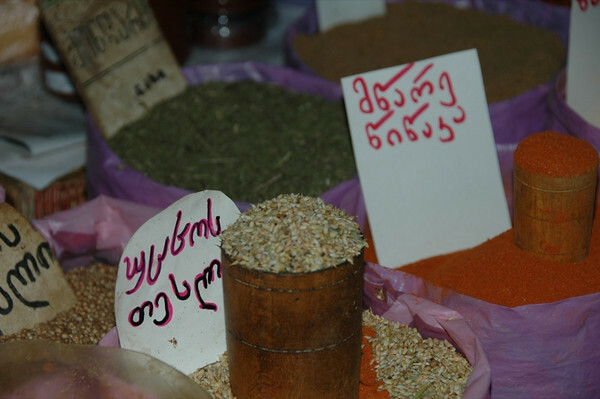 Read more about Georgian Food and our visit to Kakheti. This woman ground fresh garlic with dried peppers to make Adjika, a spicy Indian pickle-like paste - while the women in the background watched and wondered. Try adjika with fresh cucumbers and veggies. Very tasty. Read more about Georgian Food and our visit to Georgia. 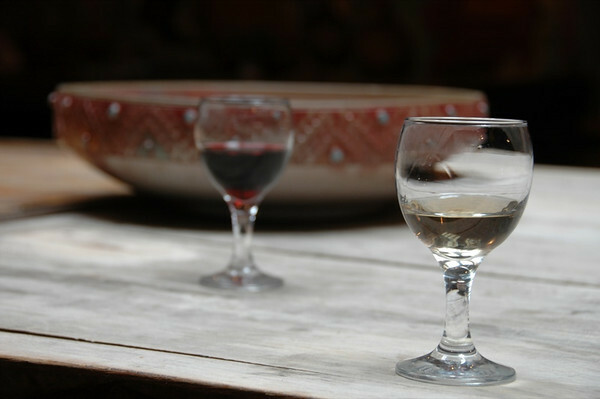 There is an option to taste wines from the Tsinandali winery for 5 Lari/person ($3). We tried three varieties. Unfortunately, none were particularly outstanding. When the tasting room host tried to sell us a bottle, she explained that the bottled wine would be much better than what we had tasted. Tasting bottles slowly oxidize in the fridge through a trickle of tourist traffic. Read more about Georgian Food and our visit to Kakheti. 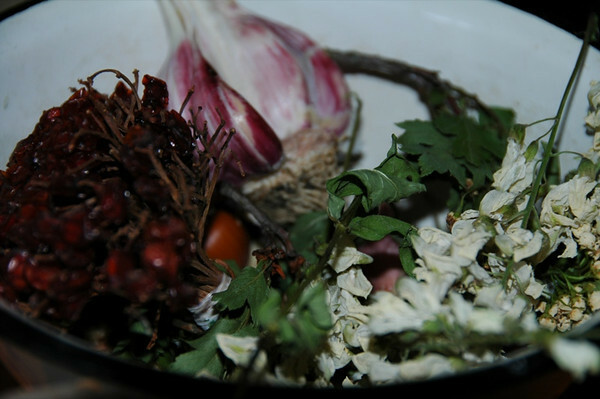 A magical bowl of dried flowers, herbs and garlic used to create savory and liver-cleansing teas and dressings. Read more about Georgian Food and our visit to Georgia. 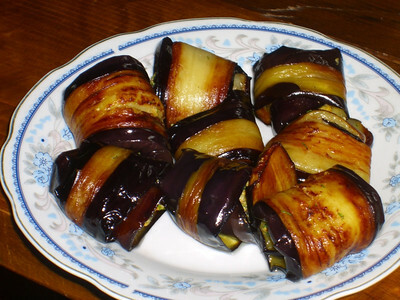 Badrijan, roasted strips of eggplant filled with a ground walnut and garlic filling. Delicious! This particular batch crafted by the capable hands of Lali in Kisiskhevi. Read more about Georgian Food and our visit to Georgia. The result of Lali's lessons with us on how to fill, twist and tuck khinkali. After a few twists, some turns, a wing and a prayer, they are dropped into a pot of salted, boiling water in order to cook the meat inside. If assembled correctly, all the juices stay in the dumpling just long enough to dribble down someone's shirt on the first bite. 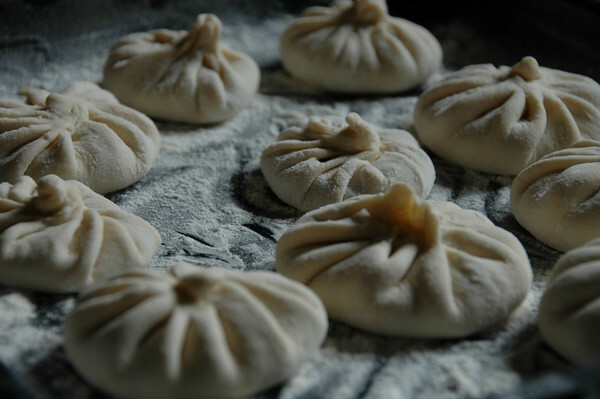 The trick: eat khinkali with your hands, while keeping the hot juices inside the dumpling as you eat. Not to be missed when in Georgia. Read more about Georgian Food and our visit to Georgia. 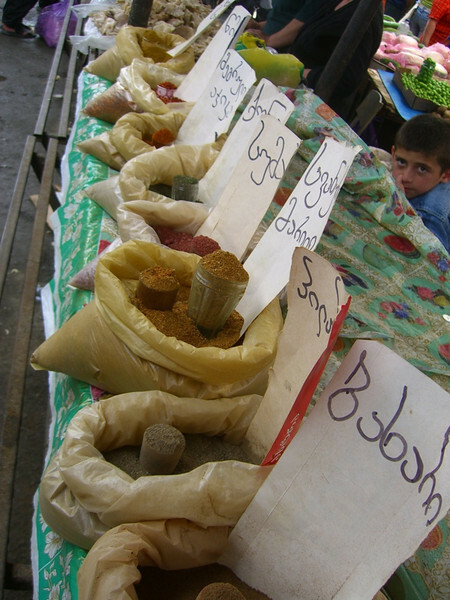 Bags of fragrant spice mixtures at the Telavi main market. Read more about Georgian Food and our visit to Georgia. 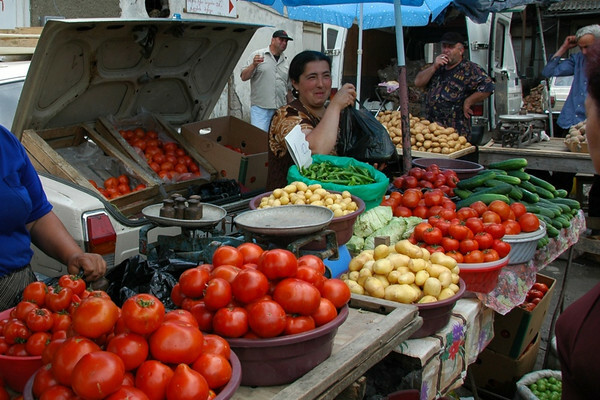 Trunks filled with vegetables at the Telavi main market in Kakheti. These tomatoes were so sweet you could eat them like fruit. As amazing as these are, we're told that they are nothing compared to the tomatoes that come in August/September. 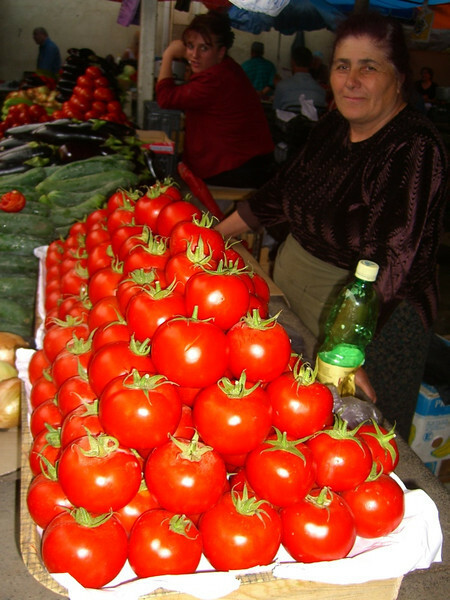 Read more about Georgian Food and our visit to Kakheti.